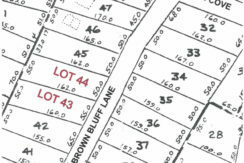 2 Wooded lots on Brown Bluff Lane at Woodlawn Shores. Great double lot for mobile home. Woodlawn Shores water available on road.